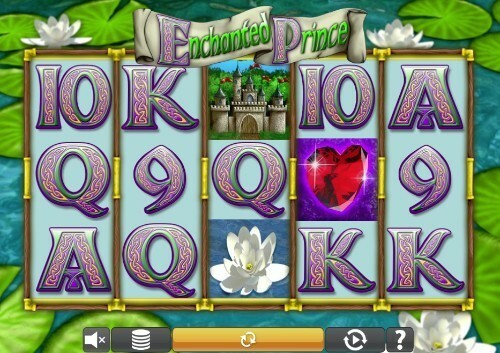 Enchanted Prince is a 5 reel, 25 payline slot game with a 94.9% RTP. This UK Online Slot comes with Free Spins, Scatter symbol and Gamble features. Spin the reels on this fairy tale online slot by Eyecon offering 25 pay lines, a 3 x 5 reel grid, a 94.5% RTP, the exciting traditional Eyecon 50 / 50 gamble feature. But there’s plenty more magic on offer from the bonus rounds and the special symbols which are featured in this incredible slot! The name of Eyecon’s popular slot gives a lot away, so, as you can expect with the Enchanted Prince online slot, you are transported to a fairy tale utopia where you can relive one of the most popular fables ever told. The story first came to life in 1889 in the novel ‘the Frog Prince’, however it is much more commonly recognised through the retelling by the Brother’s Grimm written version. However, elements of the story may even date back further than that! Some say that parts of the stories date all the way back to Roman times. The story followed the basic premise of a frog which came to be king. Disney eventually got their hands on the fairy tale in 2009 when they released ‘The Princess and the Frog’. In the original tale, a spoiled and bratty princess befriends the frog reluctantly. The first time she meets him he appears after a gold ball falls into the pond he is living in. Thanks to the gold ball, he magically transforms into a prince. More modern versions of the story tell the tale a little differently, and it is a kiss from the princess which transforms the prince. In the Brother’s Grimm version, it was a spell which broke the curse. Whichever tale you favour the most, you are sure to find plenty of appeal in the Enchanted Prince online slot which doesn’t make it all too clear how the frog came to be a prince. In March 2013 Eyecon contributed their talent and vision to the legacy the tale and brought it to life which had never before been enjoyed. Now, fairy tale fans are able to indulge in the story at the same time as having the chance to win generous amounts of cash! Eyecon always like to keep their online slots light, breezy and easy to play. But that doesn’t mean that there aren’t bucketloads of charismatic charm to their games. As you’ll spin the reels on the 5 x 3 reel slot game which offers you 25 different ways to win, you’ll also be able to enjoy the excitement of freeing prince charming and breaking the spell. Don’t worry, kissing frogs is totally unnecessary! The background of the online slot is the pond which the frog once called home. In the deep blue waters you’ll see plenty of lily pads and water lilies giving the backdrop a charming feel. The reels will take up most of the screen when you are playing on desktop or laptop. There’s a slightly regal feel to the borders of the reels, it’s almost like it was made to be fit for a princess! You’ll see numerous themed symbols on the reel along with some of the more traditional online slot alphabetical and numerical symbols. Each of the symbols are worth a different amount of money, and some are special symbols which can help you to really cash out big on this highly volatile slot! As with most Eyecon games, they have kept the soundtrack to an absolute minimum. Instead, you’ll only get to hear anything when you spin the reels and achieve a winning combination, then you’ll be delighted with the sound of a traditional slot machine paying out to give the game a simple but classy feel. Play your own favourite music while you are playing the Enchanted Prince online slot and you will never miss a thing! Now we’ve run you through the backstory to the Enchanted Prince online slot, it’s time to introduce you to how the game works. It’s clear that Eyecon really stretched their imaginations when they were coming up with the gameplay for Enchanted Prince. It comes with plenty of new and exciting features that you may not have noticed on their other online slot games. They tend to keep things very basic, but Enchanted Prince is definitely an exception to this rule. Along with the standard symbols, you will also get to enjoy the delights of the wilds and the scatter symbols. The wild symbol to this online slot works as it usually does with Eyecon’s games and substitutes and replaces all other symbols. The wild symbol is represented by the regal crown which is adorned with plenty of glistening gems. Along with substituting symbols, the wild will also double every win when it has helped to form a winning combination! The scatter symbols serve the purpose of transporting you to the bonus round in the online slot, which can offer you up to 25 free spins! But we’ll cover more on the bonus round later on. First, we’ll introduce you to the symbols which you will be playing with in the main mode of play, because despite the shiny allure of the free spins, there is still much to be won with the standard symbols in Enchanted Prince. In this game, the symbol which can allow you to win free spins is represented by potentially the most charming frog you have ever seen. He’s done up in his prince’s get up which comes complete with a crown. You will trigger the free spins round when you land three or more prince charming frogs on the reels. The highest paying standard symbol is the blonde-haired princes, you’ll soon come to love her for more than her looks once you find out exactly what she can offer you in terms of prizes! If you’re lucky enough to find 5 princess symbols on an active pay line you will automatically be given a 2400x multiplier which will be applied on your original stake amount! The second highest paying symbol is the castle, which will give you a 1800x multiplier which is still incredibly generous of Eyecon, even more so when your prize can be doubled if the wild symbol helps you to create a winning combination! The return to player rate on Enchanted Prince is set to 94.9%, so it’s classed as a highly volatile slot which you can expect plenty of frequent wins from. Eyecon have kept it fairly light with the bonus features, as they do with the majority of their games. However, they never seem to diminish in popularity, so they definitely must be doing something right! How many free spins you will get to enjoy in this round will depend on how many scatter symbols you see on the reels in the main mode of play. However, Eyecon have been a little more generous than just giving you a maximum of 25 free spins! The free spins round is able to be triggered anywhere up to 15 times when you see more scatter symbols on the reels. You do the maths! You could be in the free spins round for quite a while and have the chance to win large amounts of money without spending a penny. It’s no wonder why our player at Money Reels love free spins so much! Unlike the free spins bonus round, the 50 / 50 gamble bonus feature is totally optional and up to you whether you want to use it or not. When the feature becomes available in the game, it will give you the option to gamble with your last winning combination. To win the feature you will need to pick one of two options, then the outcome of your choice will be revealed. Using this feature can allow you to win up to £32,500! Or you could stand to lose it all if an incorrect selection is made, so make sure you use this option carefully and only use it when you’re feeling lucky! Sadly, that’s all there has to say when it comes to the bonus features, so if you’re looking for a game with a few more fun options we’ve covered some of the best alternatives to Enchanted Prince by Eyecon and other game developers down below. Eyecon are one of the biggest contenders in the slot game world right now. They first established themselves back in 1997, before most homes even had an internet connection. Traditional slot machines may have been much more popular than online slots back then, but thanks to the talent and dedication from software developers such as Eyecon, online slots are now even more popular than land-based slot machines. Who really wants to leave the comfort of their home to travel to the casino to play on generic machines which give you far lower cash rewards and far fewer themes to explore! Eyecon now have over 60 titles in their portfolio, their first online slot to be released was “Temple of Isis” which was released in 2003 just before their most popular slot yet; Fluffy Favourites. The Fluffy Favourites Franchise is one of the most successful there is today! In fact, the series might be the largest there is to play. By looking at Eyecon’s games, you will notice that they always tend to run with an incredibly cute and adorable feel to them. Alongside Enchanted Prince, their other popular online slots include 99 Time, Autumn Gold, Beez Kneez, Fluffy Too, Shaman’s Dream, Irish Luck, Happy Mushroom, Kitty Payout, Piggy Payout, plus plenty more which you will find on Money Reels. Eyecon’s games aren’t just popular in the UK, their games are played all across the globe, they didn’t find it hard to establish themselves as a global brand as they have head offices in both the Channel Islands and in Australia. In 2018, the reels on their games were spun over 6 billion times! Now that’s fairly impressive! There’s plenty more to expect in the future from Eyecon, as they are gradually increasing their production rates in competition with the other leading game developers. But it has to be said that no one does cute and cuddly slots like Eyecon. Here’s what the game developers had to say about Enchanted Prince over on their website where you can try out the game in demo mode to see if it’s for you! If you weren’t blown away by what Enchanted Prince has to offer you, there are plenty of magical online slots in their portfolio. There are plenty of fantasy-themed slots in their portfolio, but we’ve pulled out two of the best ones which we think you will enjoy! Out of all of Eyecon’s online slots, Happy Mushroom UK slot may be the most visually spectacular. They really have taken the aesthetic of the fantasy slot to the next level. So, if you were a little disappointed by Enchanted Prince, Happy Mushroom is a solid option. You’ll have plenty of adorable symbols to play with along with the screen being lit up by the happiest mushroom you will have ever seen if your life. The reels look a little similar to a school chalkboard for an awesome hit of nostalgia. The bonus rounds are incredibly generous as are the cash rewards you can earn by spinning the reels. The 5 x 3 reel slot offers 25 different pay lines and an auto spin function which allows you to spin up to 100 times in auto mode! The bonus round takes the form of a mushroom adventure and can present you with 100x your original stake amount. With the free spins round you can get anywhere up to 25 free spins alongside the 100x multiplier! That’s definitely a step up from what Enchanted Prince has to offer! Kingdom of Cash slot is much more similar to Enchanted Prince than Happy Mushroom in terms of the theme, as you will be transported back to the middle ages, to an incredibly regal setting where you will want to grab as many jewels and treasures as you possibly can! Although it isn’t all about the gold and finery, there’s also a goblin to look out for on the reels! As with most of Eyecon’s games there are 25 fixed bet lines to choose from and the wild works in a similar way to as you saw with Enchanted Prince. But the bonus features are much more enticing. With Kingdom of Cash you will experience a free spins round which is very similar to Enchanted Prince with the addition of the Combat feature where you will get to choose from a selection of different opponents. This game can go on for up to 4 rounds, and if you come away victorious, you can earn anywhere up to 100x your original stake amount when you entered this bonus round! If you’re fond of your Disney characters you will absolutely love Twinkle. The story will take you out to sea where you will get to accompany Twinkle on a mission, although sadly she gets captured by the evil pirate captain on her adventures. Some of her friends have also been captured, and it’s pretty much up to Twinkle to save the day. But really, all you need to care about is striking up some of them winning combinations. Which is easy enough on the volatile slot. Once again you will get to play with 25 different bet lines, and enjoy up to 25 free spins with this online slot. As with Kingdom of Cash, you’ll get not one, but two bonus features alongside the 50 / 50 gamble feature. The Prize Pick feature will allow you to win anywhere up to 100x your original stake amount when you got transported to the game. We’ll put our hands up and be the first to admit that all of Eyecon’s games are slightly similar, so if you’re looking for something totally new in terms of gameplay but you still want to keep with the fantasy theme, we’ve picked out two of the best online slots available to play today by different game developers. Beauty and the beast slot was released later than Enchanted Prince in 2017, the online slot offers 20 different pay lines on the 5 x 3 reels and a much higher RTP of 97.1%. The maximum you will be able to cash out with is 10,000 coins, and you will also get to experience some stunning visuals. Who doesn’t love Jack and the Beanstalk? Now you can enjoy it in the form of an online slot! The animations and graphics are incredible despite the online slot being released in 2013, there’s an RTP of 96.3%, 20 different bet lines to play across and a whopping 600,000 coin jackpot to be won! You’ll get to take advantage of the walking wilds, free spins which can be re-triggered during the play, and the exciting Treasure Hunt bonus feature. It’s a highly volatile slot which is brilliant to play both on mobile and on desktop. The 3D graphics make it a pleasure for you to keep on spinning and enjoying the exciting animations which this game offers! Enchanted Prince first came out in March 2013, however the mobile version of this game wasn’t released until three years later in 2016. But was the mobile game worth the wait? Absolutely. If anything, the mobile gameplay actually looks a lot cleaner and crisper to what you will expect to see if you log into Money Reels to play on your desktop or laptop. However, you choose to play Enchanted Prince you will be treated to seamless play and a story which will immerse you in the magical narrative of this classic story! As hundreds of new online slot games are released every year, it would be hard for the media to keep up with all the latest releases. So, sadly, news of Enchanted Prince didn’t quite make it to the front of any newspapers. But a few review sites caught wind of the release such as Online-Slot.co.uk, they weren’t overwhelmed by the release, but they still dubbed it as a solid slot.